Yemi Amu is the co-founder and farm manager of Oko Farms and the Farm Manager at Oko Farms Aquaponics Center in Brooklyn. She directs all of Oko Farms' programs including education, design/build projects and community related activities. 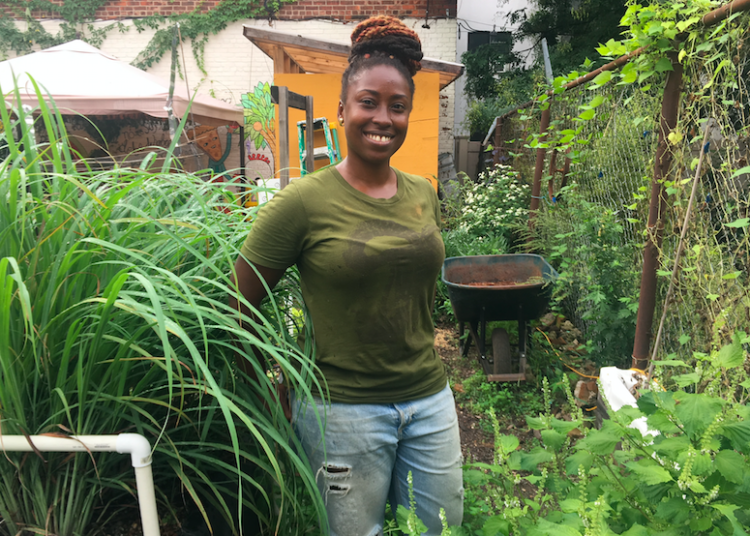 Over the past decade, she has facilitated the creation and maintenance of over 20 edible spaces throughout NYC; created and implemented various culinary, nutrition and gardening programs for both youth and adults; and promotes aquaponics as a tool for environmental awareness and stewardship. Yemi has a M.A. in Health and Nutrition Education from Teachers College, Columbia University. She was awarded Hunter College NYC Food Policy Center, Rising Star in NYC Food Policy (2016). Lexi Harder is Operations Manager at the Moore Street Farm. She came to Oko Farms after graduating from Scripps College with a Bachelors degree in Sustainability in 2016. At the farm, she ensures the successful implementation of all educational and design/build projects. She currently writes about sustainable farming at the Ecocentric blog. In her previous work, she has managed a 70-member CSA that brought fresh produce to members of the Claremont, California community. She also worked for Fallen Fruit from Rising Women, a Claremont social enterprise that collected and processed donated fruit from the community to prevent food waste. Jonathan Boe is co-founder of Oko Farms. He designed the aquaponics system at Oko Farms Aquaponics Center. He consults on aquaponics design/build projects from Oakland, CA where he is currently based. Jon is also a chef and graduate of Johnson and Wales University.